Backing up your wordpress blog regularly is important to ensure that you don’t loose all your blog posts and other information in case something goes wrong with your wordpress blog. 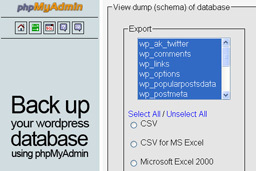 It is quite simple to back up your wordpress database using phpMyAdmin and I will go through the steps below. You can easily restore your wordpress database using a similar process. An alternative to this method is to back up your wordpress database using the “WordPress Database Backup” plugin. From your web hosting control panel login to phpMyAdmin. Select your database from the top left drop down menu. Click on the “Export” tab in the top navigation. 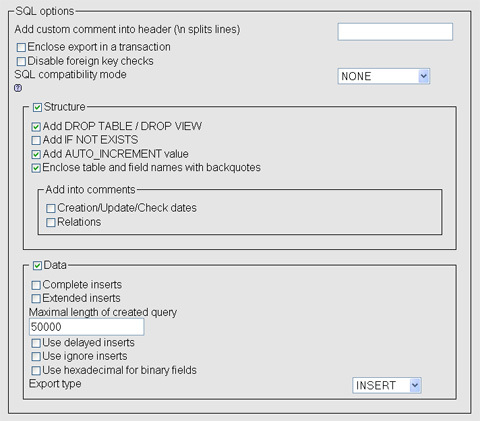 Select all tables to export and ensure that you select the “SQL” option. Ensure that the following SOL Options are selected. Tick the “Save as file” option and press go to export your database. You will be prompted for a file download, save this file in a safe place on your computer and your done! This just backs up your posts and comments. Your other wordpress files including images, plugins and themes need to be backed up by downloading your wordpress files via FTP. You should also backup these website files regularly. To do this just FTP to your web server and download all files in your”public_html” folder. 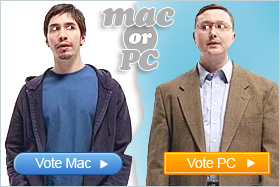 Save them onto your PC in a safe place. You may also like to store these files on an external hard drive just to be extra safe. 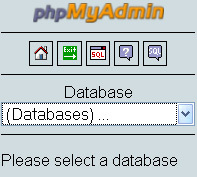 You may also be wondering how to restore your database from backup using phpMyAdmin.